SPACE IS HARD. The past nine months have been difficult ones for rocketry. Multiple failures of Russian launch vehicles, the loss of SpaceShipOne during a test flight, the Antares rocket with the Orb-3 mission falling back to the launch pad in a fireball, and most recently, the disintegration of the SpaceX Falcon 9 rocket carrying a resupply mission to the International Space Station. There is no getting around it. Even after five decades of launching satellites and humans into space, the truth remains that as we strive to become a space-faring species, we are pushing against the extreme edges of our technological prowess. We are creating machines to be able to perform at a level previously undreamt, while making demands of metals and other materials to be thinner and lighter, yet also stronger than ever before achieved. We push our machines just to this side of impossibility, and occasionally even beyond. Humanity has always been an inquisitive species with an innate desire to explore the unknown. With that comes failure and disaster from time to time. But what defines us is our ability to look past our flaws, to overcome our mistakes, and to keep pushing those boundaries just a little bit further with each new attempt. In this issue of RocketSTEM we bring you both success and failure. The success of the previously untested Lunar Rover sent to the Moon that carried the Apollo 15 astronauts further than any moonwalker before. And, of course, the failures of the above mentioned rocket launches. But rather than tell you how hard it is to build and launch a spacecraft, we invite you to try for yourself. Kerbal Space Program is a game that is simple enough for a kid, yet advanced enough for engineers at NASA, JPL, and SpaceX to enjoy playing it too. Download the game and run your own space agency. Just don’t be discouraged when your first rocket explodes upon launch. 02 Arrival at Pluto – New Horizons has almost completed its long journey to be the first visitor to Pluto. 08 A Car for the Moon – The race to design and build a lunar rover was relentless, but ultimately successful. 14 Al Worden – We chat with the astronaut who set the bar for the most far out spacewalk ever. 40 Stellar Clusters – Learn more about these amazing groups of stars visible in the night sky. 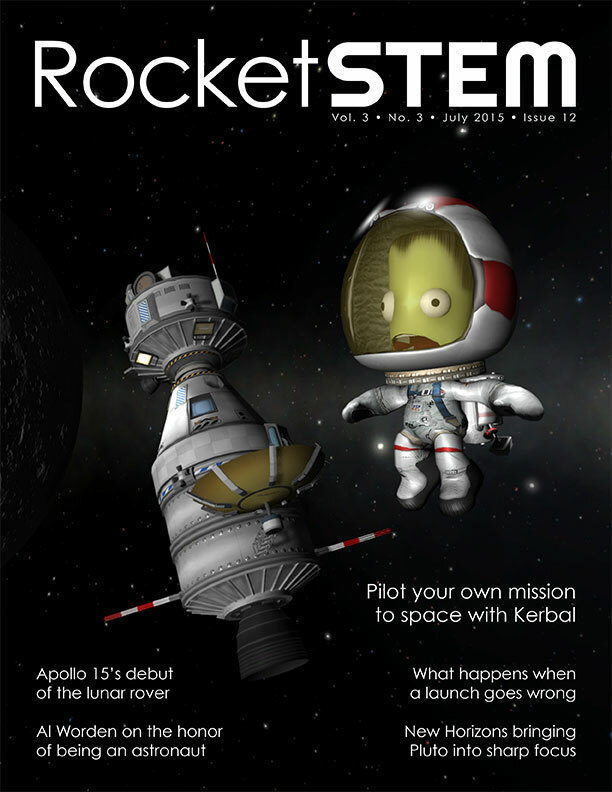 44 Launching Kerbals – KSP brings out the hidden rocket scientist inside all of us, both young and old alike. 54 Bad Rockets – Launching to space is a risky business. What happens when a rocket misbehaves? We’ve established a page at Patreon (www.patreon.com/rocketstem) where you can support our endeavours. By making a pledge via Patreon, you will be giving a donation automatically after each new issue of the magazine is published. On the months where we do not publish a new issue, you’ll owe nothing.